Construction of a memorial marker at the grave of actress Estelle "The Golden Girls" Getty has begun. Her plot at Hollywood Forever Cemetery has been unmarked since her burial just over a year ago. See the first photos and follow the story development at Hollywoodland by Allan R. Ellenberger, who was first to report the news today. 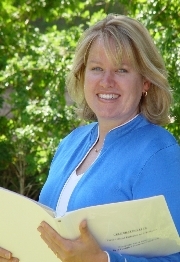 I've very excited to announce that my friend and fellow Grand View volunteer, Linda Mustion, has joined our ranks at ValleyNews.com. 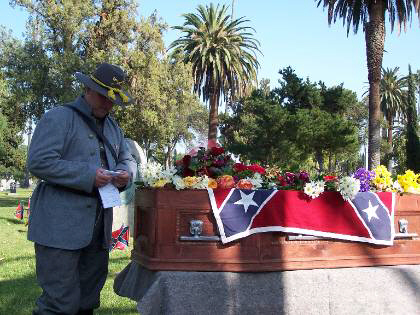 Her first ValleyNews.com story is a wonderful account of the Confederate Memorial Day ceremony held recently at Hollywood Forever Cemetery. I have lived in Burbank for 55 years and have attended the local schools, graduating from Burbank High. I also worked here in Burbank for almost 33 years before the company I worked for closed their doors in September 2004 and I was out of a job. I keep busy with several organizations and I enjoy doing family research. I am also an avid grave hunter traveling to many different cemeteries. I enjoy U.S. history, people and places. I am also a Military Researcher, Historian and Biographer. I research all the boys from the city of Burbank and Glendale that lost their lives in the service of their country. Congratulations on your first story, Linda! Keep up the great work. For those of you interested in finding out who shot Lana Clarkson (remember, innocent until proven guilty in this country) check out the Phil Spector Trial blog at the LA Times. Music mogul Spector, 67, has been accused of murding actress Lana Clarkson, 40, by shooting her through the mouth in the foyer of his Alhambra mansion in the wee hours hours of Feb. 3, 2003. Spector claims it was suicide. The trial is currently in the jury selection phase. Thanks to Scott Michaels for flagging me on this latest informational blog.